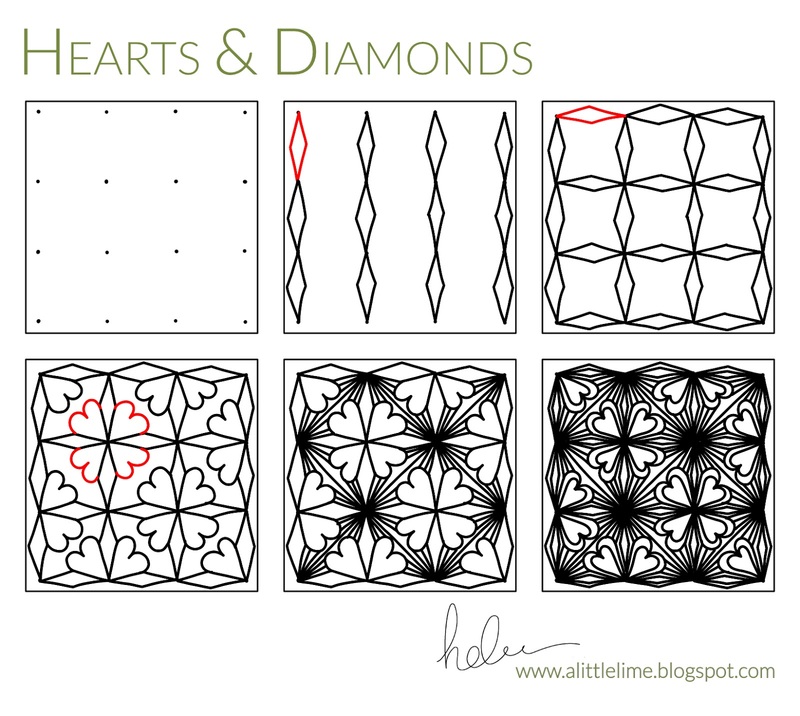 I wanted to create a pattern with Hearts and Diamonds. And, now, I'm happy to say my Lifelong Dream has been achieved (well, o.k., "lifetime" maybe overstating it a little, it is probably more accurate to call it "vague idea that I liked the sound of".......but that doesn't sound anywhere near as exciting, right?). hahaha. You could stop at step 4, but I really like the way the diamonds effectively "disappear" and the hearts become more pronounced as the line detail is added in step 5 and 6. If you want to add these lines too, the pattern could begin with a square line grid framework instead if you find that easier. Oh Helen - this is a good one. One quick play and I can see so much potential for variation depending on how many lines you use or don't, darkening certain parts etc. I think you could have free standing sections of it too, or a ribbon. I'm also in quite an allergic to hearts mood today and it works well with teardrop shapes instead of hearts. Thanks for sharing - looking forward to further explorations. This is a wonderful tangle, Helen. I wanted to wait commenting until I had actually used it and I love. Because I made it in a wonky grid I, too, made variations to it. Thanks so much. A beautiful pattern, simple steps but awesome outcome. Thank you for sharing it with us. I love it Helen!! I've been on hiatus being busy with other things (life - Aaaaaaahhhhh) and this is a wonderful tangle to get going again. Thank you! !